And with this game, Kerala is out of the #worldcup . And at the end of another heart-breaking sojourn Argentina leaves the African shores, close on the heels of neighbouring heavy-weights Brazil. Dejected, disappointed, desolate, humiliated...Another frustrating end to a hugely promising enterprise for millions of Argentine football fans of Kerala. Argentina and Brazil may lie on the other hemisphere, wrong side of equator and are culturally, linguistically and racially like chalk and cheese compared to Kerala. Still, football crazy Keralaites carry the two nations in their hearts just like Lal Jose's Cuba Mukundan adored China and err, Cuba. Ever wondered what makes these remote South American countries so close to Keralites? Oh yes, if you want to explore political connections then Che Guvera was Argentine. hmm...commie-commie, bhai-bhai? Not the reason why I had a severe crush on Argentine tennis-beauty Gabriela Sabatini in my early teenage though she lost to that German blondie Graf more times than I could count then. Italia 1990 was the first time I probably heard about this country called Argentina, or should I say I saw and heard about this magic-man called Maradona and then linked him to Argentina. 10 years old at the time, football became synonymous with Maradona and Argentina to me. I stayed awake with my football-fan dad to watch the '90 World Cup matches but would eventually fall asleep someway through the match. Mostly it was the morning newspaper which broke the news of my favourite team's progress until resulting in the heart-break loss to West Germany in the final. 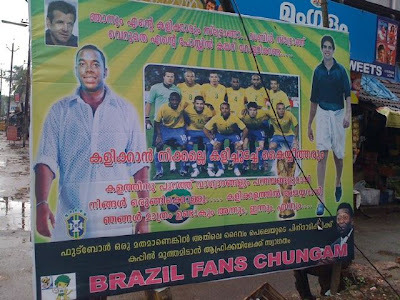 Maradona, Pele, vintage football, Che, Communism, coffee, samba... you can decide why, but Kerala's fondness of the Latin American footballing nations underlines the ability of sport to erase boundaries and cross barriers, to create legends which circumnavigate the globe irrespective of race, language and religion. Argentina has been giving Keralaites regular doses of World Cup anguish ever since 1990. The presence of Argentina was the major reason why I followed Soccer World Cup closely ever since I learned the game. I remember walking back dejected from the TV kiosk in John Balan Park in Bartonhill, Trivandrum after watching Romania knocking them out in 1994. Holland repeated the honours in 1998. Argentina struck an unbelievable low when they exited the 2002 edition in the first round itslef. They bowed out to hosts Germany in shootout in 2006 and history repeats against the nemesis yet again, but today it has been calamitous! It still continues. 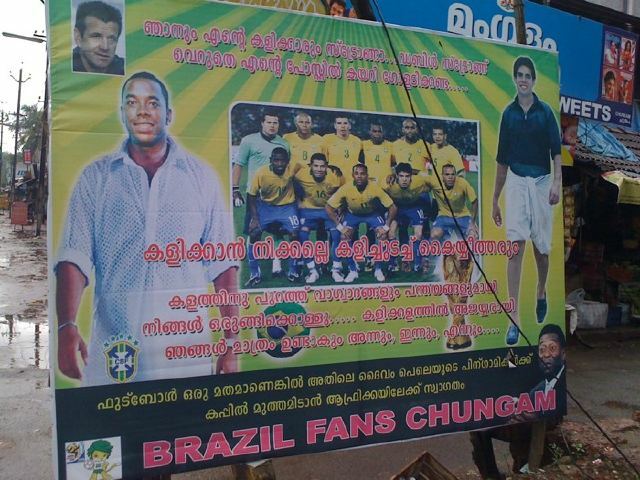 Nikhil said it right, a savage chunk of Kerala football fans have their loyalty to either Argentina or Brazil. With the disastrous results in the past 2 days of this World Cup, its shutters down for football frenzy in Kerala in a big way. Brazil knocked out, Argentina butchered, another popular team and European holy-boys England is already back, tail between their legs. South Africa 2010 has failed to produce those magic memories consistantly; its all merely statistical. Great goals have been miserably few and far in between, big names turned mere bubbles overnight, branded minnows gave the bigwigs run for their money and the football 'experts' left guessing after all predictions and calculations went astray. Have we seen Kaka, Messi, Rooney or Ronaldo the way we wanted to see them? We've also seen Maradona and Dunga leaving the field humiliated. Last years finalists packed their bags home after Round 1. The whole world laughed at the English hype-stars and French disgrace-figures. Great students never make great teachers. Same way great players seldom make great coaches. Also how the line has blurred between a hero and a villain... Suarez, Gyan, Ghana and that last-gasp moment may just become the lasting legend of this edition. PS: With Spain just filling the last semi-final slot we may well see a new winner this time in South Africa. I'd back Holland and Spain to go and win it from here just because they have played beautiful football all through without tasting much success historically. But this young German side appear more and more threatening, with each passing match. PPS: Almost forgot Uruguay, the other Semi-finalist. A country of 3.5 million people, yes, almost the same no of people in Trivandrum district. Not going on to useless whining, but anyone here has any high hopes of hearing the Indian national anthem in a Football World Cup before the end of our lifespan?